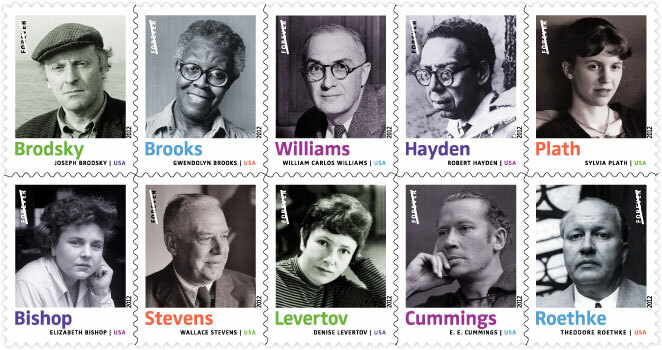 In 2012, The United States Post Office is honoring ten poets with their very own postage stamps! Yes, the visages of Elizabeth Bishop, Joseph Brodsky, Gwendolyn Brooks, E. E. Cummings, Robert Hayden, Denise Levertov, Sylvia Plath, Theodore Roethke, Wallace Stevens, and William Carlos Williams are to grace all your Cablevision bills. And they’re priced at “forever,” too! Simic, who was born in Yugoslavia in 1938 and immigrated to the United States in 1954, is the author of more than 60 books in the U.S. and abroad, twenty titles of his own poetry among them, including That Little Something (2008); My Noiseless Entourage (2005); Selected Poems: 1963-2003 (2004), for which he received the 2005 International Griffin Poetry Prize; The Voice at 3:00 AM: Selected Late and New Poems (2003); Night Picnic (2001); The Book of Gods and Devils (2000); and Jackstraws (1999), which was named a Notable Book of the Year by the New York Times. His other books of poetry include Walking the Black Cat (1996), which was a finalist for the National Book Award; A Wedding in Hell (1994); Hotel Insomnia (1992); The World Doesn’t End: Prose Poems (1990), for which he received the Pulitzer Prize for Poetry; Selected Poems: 1963-1983 (1990); and Unending Blues (1986). Simic has also published numerous translations of French, Serbian, Croatian, Macedonian, and Slovenian poetry, and is the author of several books of essays, including Orphan Factory. He has edited several anthologies, including an edition of The Best American Poetry in 1992. Marjorie Perloff delivered the 2009 Wallace Stevens Birthday Bash lecture at Hartford Public Library. The title of her talk was “Beyond Adagia: Eccentric Design in Wallace Stevens’ Poetry .” John Serio was last year’s speaker and he recently edited a new Selected Poems of Wallace Stevens. Dan, Karim and David are board members of the Friends & Enemies. Marjorie Perloff with Lonnie Black, also a board member, and John Crockett, a longtime member of The Friends & Enemies and someone who can actually tell stories of meeting Wallace Stevens on a number of occasions. Jim Finnegan & Kat Lyons toast a sucessful event. Kat Lyons runs Connecticut Center for the Book, the organization that sponsored the Wallace Stevens Birthday Bash. In memory of her husband William T. Ford, Dee Ford of Anchorage Alaska donated this lovely bronze bust to the Wallace Stevens Room at Hartford Public Library. Saturday, November 7 2009, 6:30 P.M.
Birthday Cake & Champagne after the Program! The Friends & Enemies of Wallace Stevens. June 11, 2009, 5 p.m. Please join us for the dedication of the Wallace Stevens Walk. On Thursday, June 11, at 5pm, employees of The Hartford Financial Services Group, members of Friends & Enemies of Wallace Stevens, as well as the general public will convene for a dedication of The Wallace Stevens Walk, a 2.4 mile self-guided walking tour that traces the path the poet took each day to and from his Hartford home. Beginning at The Hartford, where Stevens served as vice president beginning in 1934, and ending at his former home at 118 Westerly Terrace, the Walk traverses the Asylum Avenue section of Hartford’s Asylum Hill and West End neighborhoods. The course of The Wallace Stevens Walk is marked by 13 Connecticut granite stones, each uniquely carved and engraved with a stanza from “Thirteen Ways of Looking at a Blackbird,” a poem among Stevens’ most well known and frequently studied works.